Thistles Shopping Centre, Stirling has announced one of the country’s most promising young ice skating talents, 12-year-old Brodie Sneddon, as the latest recruit to its #STIRLINGSHINES marketing campaign for 2018. Aiming to discover the undiscovered, #STIRLINGSHINES celebrates the achievements of local talent. From undiscovered photographers, designers and artists, to chefs, musicians and sports achievers, #STIRLINGSHINES is helping to put the spotlight on these inspirational people throughout the year. In recognition of 2018 being the Year of Young People in Scotland, the campaign was recently launched by local teenager Lee Welsh, whose own personal story is one of overcoming immense challenge in beating non-Hodgkin’s Lymphoma to become a rising star on the boxing circuit. Now, following on from Lee, is 12-year-old Brodie Sneddon who is taking the highly competitive world of ice skating by storm. Having first tried ice skating at the age of 8 at Stirling’s The Peak centre, the talented youngster instantly loved the experience so much that she decided to drop every other sports activity to focus on it. With a training commitment of 6 days a week on ice, ranging from 6.30am starts to evenings after school, Brodie’s ability has flourished over the last 4 years. Invaluable support from Active Stirling’s Skate UK programme within The Peak, and the support of coach Gemma Chaddock and technical specialist Dave Mumby, along with her mum and dad, has seen her win a clutch of awards, and perfect her speciality…the highly challenging Beillmann Spin. 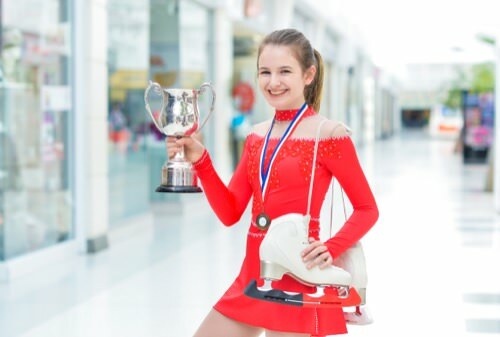 From her first competition in 2014 at the Blackpool Ice Festival where she came 3rd followed by a 1st place later that year at Ayr Ice Rink, Brodie has ascended through the different age categories with continued success. More recently she trained with two of the world’s top coaches, Olympic champions Brian Orser and Javier Fernandez. An experience that prepared her well for competing for Great Britain in Slovenia in 2017. With her focus now on the British Championships at Sheffield in December 2018, where she and her team are aiming for a top 5 place, Brodie will be devoting as much of her free time as possible to practising at The Peak as well as at Murrayfield in Edinburgh and the Time Capsule in Coatbridge. “Ice skating is my passion and there is nothing I love more than the feeling of performing, especially when I perfect a move I have worked really hard on, like a Beillmann Spin. “It was wonderful to welcome Brodie into the centre for our #STIRLINGSHINES shoot and to have the opportunity to hear about her ice skating achievements so far. “Brodie’s passion and dedication to the sport is clear and for someone so young her training ethic really is admirable, as was evident by the many trophies and medals she kindly allowed us the pleasure of seeing. Stirling Shines – Stirling Thistles campaign. Multi award-winning ice-skater Brodie Sneddon aged twelve.